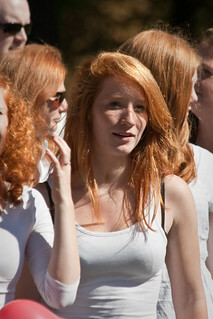 Wikipedia: "Redheadday is the name of a Dutch summer festival that takes place each first weekend of September in the city of Breda, in the Netherlands." Facts about redheads: "Red hair is seen on the heads of only less than one percent of people.in the world. Most redheads live in the U.K., Ireland, and former colonies of U.K. like Australia. Redheads are becoming rarer and could be extinct in 100 years, according to genetic scientists."